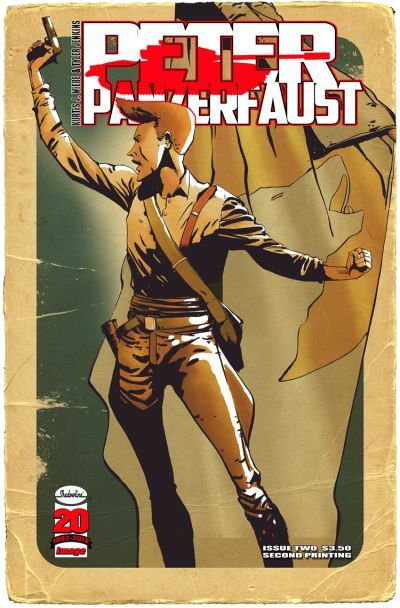 PETER PANZERFAUST, the Image Comics/Shadowline series that places the classic character Peter Pan in World War II-era France, has sold out of its second issue at the distribution level a week before its in-store date of March 14. It has immediately gone back to press and a second printing (JAN128290) will be in stores the same day as PETER PANZERFAUST #3 (FEB120514), April 11. The first issue of the series by Kurtis Wiebe and Tyler Jenkins also went into a second printing after an enthuisastic reception by critics, readers, and retailers. The second priting of PETER PANZERFAUST #1 will be in stores on March 21. After having two issues in a row sell out, PETER PANZERFAUST has been expanded from a five-issue miniseries to an ongoing title, with PETER PANZERFAUST #6 shipping in September. Wiebe is the writer of several Image series, including GREEN WAKE and the upcoming GRIM LEAPER (May) and DEBRIS (July).